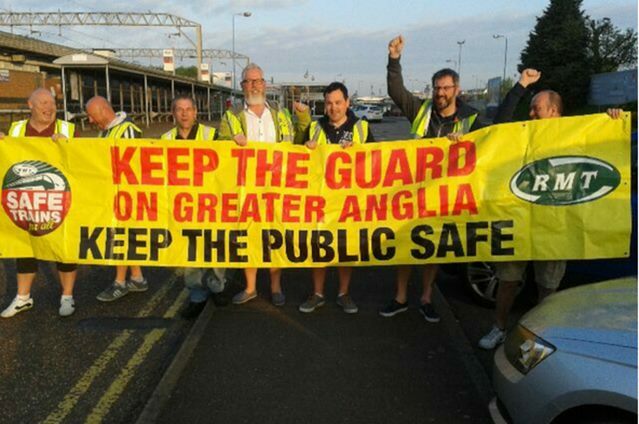 THE RMT's General Secretary Mick Cash, on 9 May 2018 said that:- "RMT members on Northern Rail and Greater Anglia stand rock solid and united once again this morning in separate disputes which are ‎about putting public safety and access before private profit on our railways. It is ludicrous that we have been able to negotiate agreements in Wales and Scotland that lock in the guard guarantee, but we are being blocked from reaching the same settlement across the North and Greater Anglia. A solution to these disputes is within our grasp but the rail companies need to stop sticking their heads in the sand, get back round the table and work with the union to bolt it down. RMT members have shown extraordinary resilience and determination in the fight for rail safety and we thank the public for their continuing support and understanding." ► Not to book on for any shifts between 0001 hours and 2359 hours, on Thursday, 24 May 2018. ► Not to book on for any shifts between 0001 hours and 2359 hours, on Saturday, 26 May 2018. RMT General Secretary Mick Cash said:- "It is a tribute to the determination and professionalism of RMT members on Arriva Rail North that they have remained rock solid for over a year now in what is a battle to put public safety before private profit. German owned Northern Rail want to run ½ a million trains a year without a safety critical guard on board in a move that would wreck both safety and access ‎to services and they should listen to their front line staff and pull back from that plan immediately. RMT has agreed arrangements in Wales and Scotland that enshrine the guard guarantee. If it's good enough for Wales and Scotland to have safe rail services it should be good enough for the rest of Britain. The Union remains ready for talks." Letter to the Editor:- "Recycling Project in Southport"
"Dear Southport Reporter, your readers might be asking what is that huge box that has arrived at Make It Work Shop CIC? Well, it's all rather exciting. 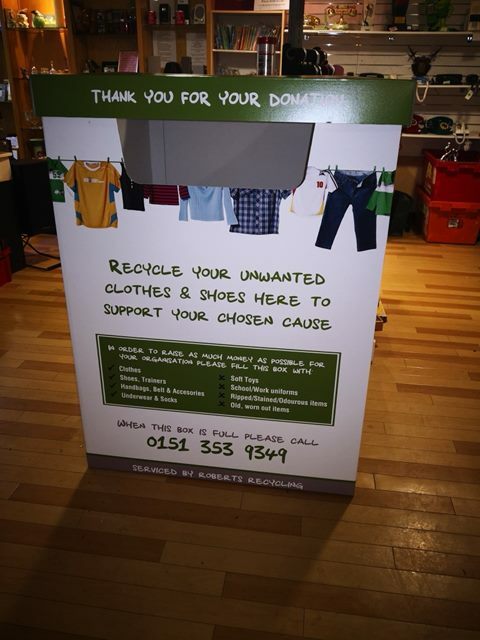 We are working with Roberts Recycling Ltd a family run business dedicated to collecting and exporting unwanted clothing. The primary aim is to divert away from landfill and supply affordable clothing to poorer parts of the world outside of the UK. Please come down and bring your good quality unwanted items to the Make It Work Shop... We are proud to be a part of this exciting project, so what can we table you ask:- Shirts, Shorts, Trousers, T-shirts, Jackets, Jumpers, Hoodies, Polo shirts, Jiggers, Bags, Belts and ties, Boots, Hats, Gloves, Shoes, Trainers, Skirts, Dresses, Vest tops, Jewellery and Swimwear. Please note that sadly we can not take:- Ripped, stained, socks, underwear, bath robes, slippers, PY's, work wear, uniforms and printed items... Thank you all in advance. We are really looking forward to this project and hope you will support Make It Work Shop. Located within Cambridge Walks, Cambridge Arcade, Southport, PR8 1EN. We are open Tuesday to Saturday, 12 noon till 5pm. If your readers want more information please do call us on:- 01704 535123." Bob Jenkins.